Our great state of Michigan does have many amazing things going for it, and – here at J&M Window Cleaning – we really wouldn’t want to work or live anywhere else. With all that in mind, however… it’s still fair to say that we don’t exactly enjoy the best weather in the States, up here! While we should be well into early spring by now, the temperatures are still hovering under 50 degrees most days at the time of writing… and that’s if we’re lucky! Still, both history and science tell us that – eventually – spring will indeed come to Michigan in earnest. The skies around Bloomfield Hills, West Bloomfield, Birmingham and Rochester will become bluer, the temperatures will rise, the rain will recede, and it’ll be time to get out and about into the open air once more. For many people, this also means entertaining others at their beautiful homes, whether that be with a barbeque or an all-out party. For everybody, this means brighter days and – by extension – a more cheerful atmosphere in which to enjoy their houses. These are just a couple of the reasons why spring cleaning is so popular, year in and year out. With the darker, colder months behind us, this becomes the perfect time to hit the reset button, get our homes sparkling clean, and look forward to the good times to come. Whether you actually ‘enjoy’ spring cleaning or not will depend on your own preferences, but one thing is for sure – it’s a whole lot easier when you’ve got some help. And here at J&M Window Cleaning, that’s exactly what we love to provide for our customers. Windows are obviously one of the most important things to take care of during the annual spring clean. Cleaner windows allow more light into your home, and even help to keep your heating bills down while you wait for the weather to get warmer. While technically you can clean your own windows, it’s much easier, faster and more effective to simply hire a professional window cleaning company. Specifically, you want one with a proven track record, which operates all across the Metro Detroit area, from Bloomfield Hills to Birmingham, and from Rochester to West Bloomfield. Now, who could possibly fulfil those criteria? Why, J&M Window Cleaning of course! 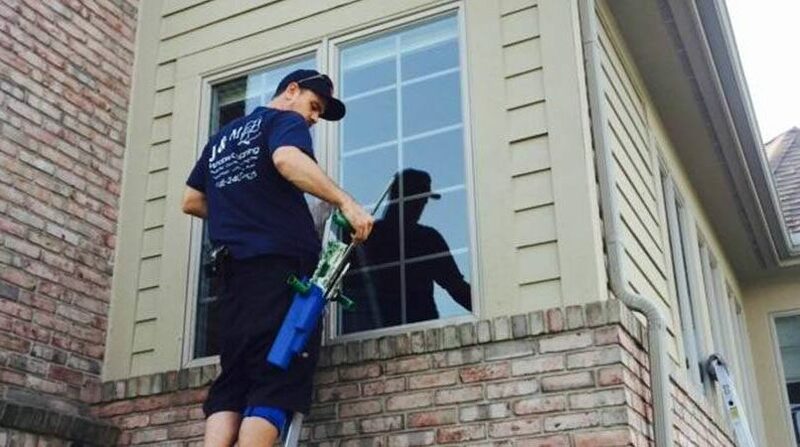 Our celebrated residential window cleaning service has been a fundamental part of people’s spring cleaning here in Michigan since 2003, and our two founders – Joe and Matt – were cleaning windows long before that. In that time we’ve cleaned windows of absolutely all shapes and sizes, on properties large, small, and somewhere in between! The killer combination of extensive training for our staff, and a regular investment in high quality cleaning equipment, helps to ensure that we achieve consistently excellent results, year in and year out. In addition to all that good stuff, we also carry $1 million per incident liability insurance, for both your peace of mind and ours, and we’re happy to provide those documents on request. Don’t let spring catch you out – it’s coming (we promise) and you need to make sure you’re prepared! Ordering a session of residential window cleaning from J&M is a perfect way to do exactly that. To get started now, simply call (248) 605-2243, or email CleanWindows@JMWindowCleaning.com. We offer professional exterior cleaning services throughout Oakland County and South-east Michigan, including White Lake, West Bloomfield, Commerce, Walled Lake, Clarkston, Bloomfield Hills, Davisburg, Novi, Wixom, Milford, Franklin, Rochester, Highland, Birmingham, Farmington, Southfield, Ortonville, Troy, Oakland, Royal Oak, Hartland, Northville, South Lyon, Plymouth, Brighton, Holly, Auburn Hills, Waterford, Keego Harbor, Pontiac, Detroit and surrounding areas. Copyright © 2016 J&M Window Cleaning. All rights reserved.